Major Sponsors make a significant impact on the Trail of Lights. At the Major level you’ll have the opportunity to create a brand new interactive display, significantly revamp or upgrade an existing display, sponsor a specialty night or program, or brand an iconic Trail destination – like the Ferris Wheel or the Zilker Stage. We’ll work with your team to create a package that highlights your business and connects your brand with our uniquely qualified audience. From brand exposure to email capture, a Trail of Lights Major Sponsorship is tailored to achieve your company’s specific goals with unique custom activations. We’ve worked with Major Sponsors like, The University of Texas at Austin, Keller Williams International, and Maudie’s Tex-Mex to create one-of-a-kind photo op destinations at the Trail. Year over year, these interactive displays have attracted thousands and have become keystone’s in companies’ holiday branding and campaigns. Other past Major Sponsors include Kendra Scott, Silicon Labs, Cirrus Logic, Lyft and more. Read more below. In 2012 Robert F. Smith challenged the Trail of Lights to create the ultimate candy destination at the Trail. 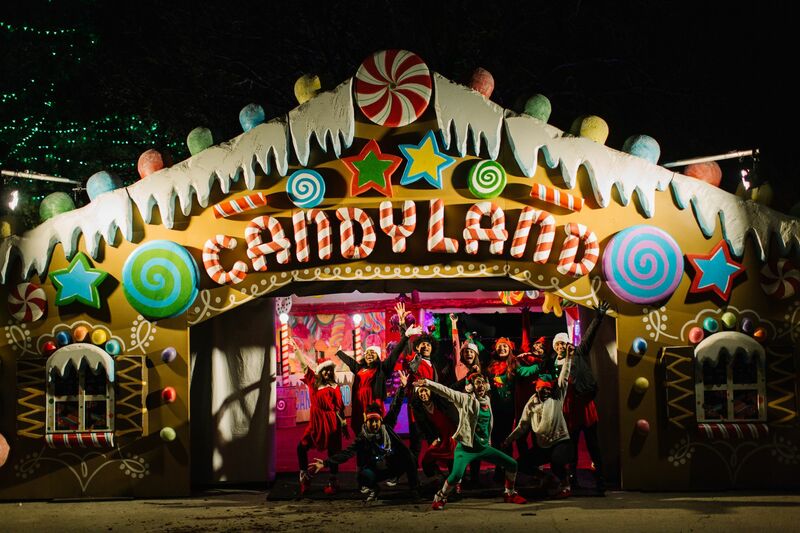 Now in its 6th year, Candy Land boasts live candy making demonstrations, an interactive candy machine, and the promise that every child leaves the Trail with a piece of candy. The Robert F. Smith Family Foundation is committed to youth development and with 905 pounds of candy distributed in 2017, Candyland has offered an ideal way to give back to all children at the Trail during the holiday season. 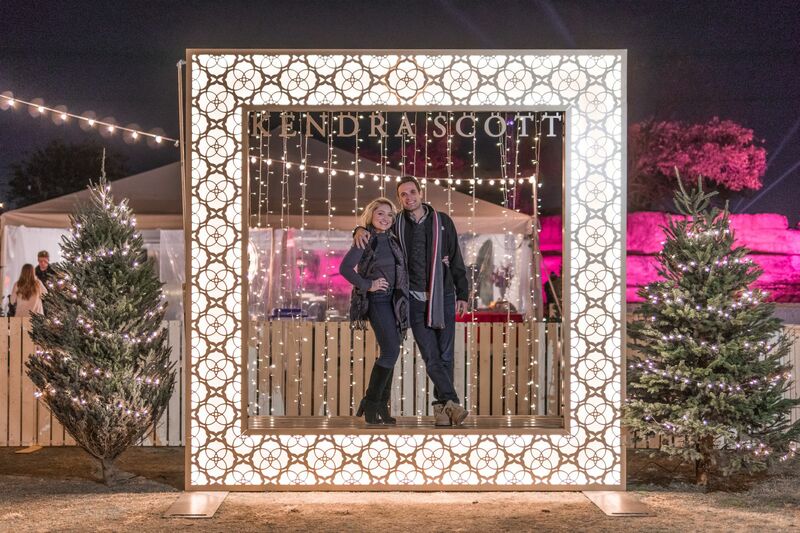 The Trail of Lights Platinum Program is the ultimate VIP ticket to the Trail of Lights and was the perfect pairing for Austin based luxury jewelry brand, Kendra Scott. Through the Platinum Program, Kendra Scott capitalized on targeted promotions and advertising to a high-end consumer market and was also able to leverage direct client interaction inside the Platinum Lounge with an eye-catching Kendra Scott branded photo frame. After holding their annual company holiday party at the Trail of Lights for three years, Keller Williams wanted to do something to give back to the Trail of Lights and the city where the company was founded. 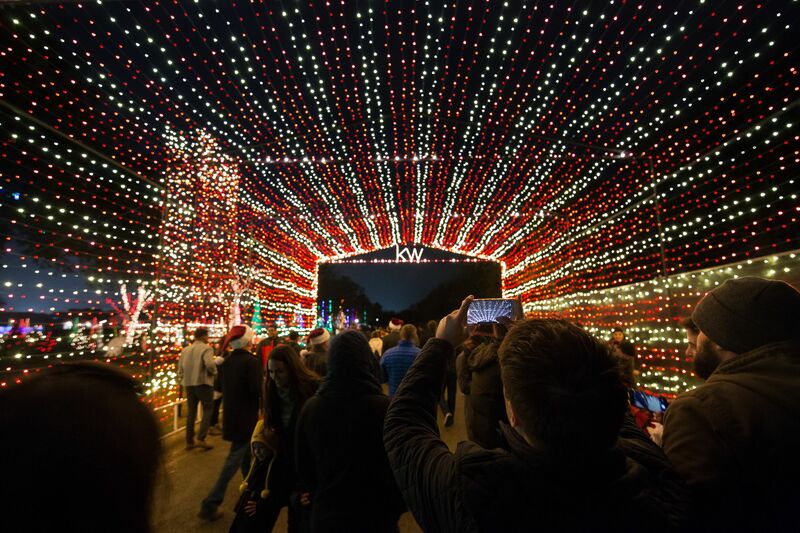 In 2016, Keller Williams worked with the Trail of Lights creative team to build an iconic new light tunnel that represented their brand and a commitment to the Austin community. The Holiday House Tunnel has become a must-see photo stop on Trail, generating thousands of social posts every year. Learn how Keller Williams put their stamp on the Trail of Lights on our blog. 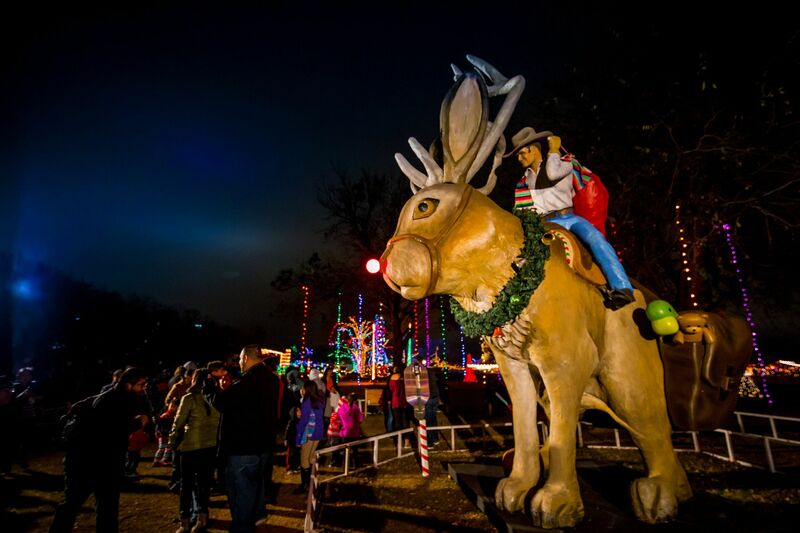 When the Big Tex-Mex Jackalope premiered in 2013 it was the first new display at the Trail of Lights in over a decade! Maudie’s wanted to create a display that captured the unique spirit of Austin and our creative team of designers brought their vision to life. Over the last 6 years, Big Tex-Mex has become a must-see Trail icon. Maudie’s has further activated the display by creating “retail-to-trail” promotions with special in-store Trail of Lights menu items and commemorative plates. Read more on the blog! Each year The University of Texas at Austin partners with the Trail of Lights to turn the trail “Burnt Orange”. 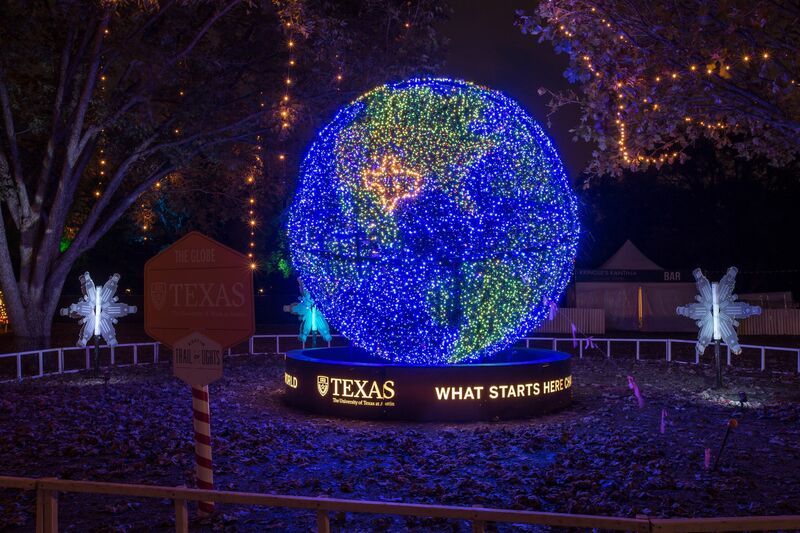 Beginning in 2014, the Trail of Lights creative team created the UT Globe by modifying an existing display structure with an interactive light display that represents the UT slogan “what starts here changes the world”. Additionally, the annual “UT Night at the Trail” offers special tickets promotion to UT students and faculty, branded activations in the ZIP lounge, and special performances from dozens of UT student groups throughout the evening. Become a Major Sponsor or request more information by filling out our sponsorship inquiry form.